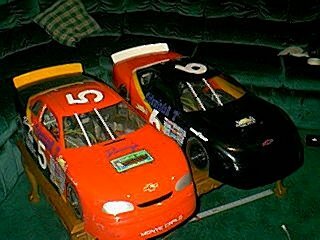 Father & Son 1/4 Scale Nascar Race Team. Welcome to The Quarter Scale Team Page! I must say "I have the best job in the world". Thats being a father to 4 kids. Of those 4, 3 are boys. John 19 is on his on now. Josh 12 and Justin 6 that enjoy racing. Josh and myself make up Team Hawthorne #5 & #6. Justin will come aboard in the next few years. He is doing very well in the 1/10 scale Legend class and I will soon move him into 1/4 scale. (But, not till I know he is ready). Oh yeah and Stephanie 17, she keeps her brothers in line. Josh has had a radio in his hand since he was 4, so he is pretty good. He loves to race and thats Great. I don't push the boys so when they are racing its because they want to be. 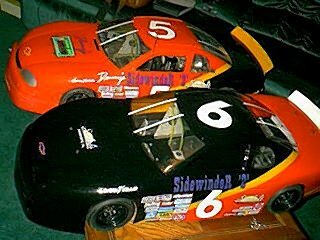 If you happen to run 1/4 scale and get the chance to run with us. Don't worry about the little guy (Josh). He don't mind rubbing fenders. We only have one rule on our team and that is we race with respect. We run clean and we pass clean or we wait. Racing is fun when it is done with respect. If your getting ready to paint that car or truck for 2001 below you will find some info that will save you lots of time and a few dollars. Click on the Decals to view Details on how to make custom decals that look great. Follow along with Justin on his first racing adventure. Follow along with updates of out last racing adventure. 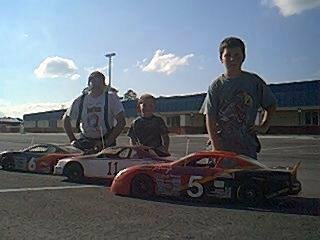 Here are a few pictures of The Quarter Scale Race Team. 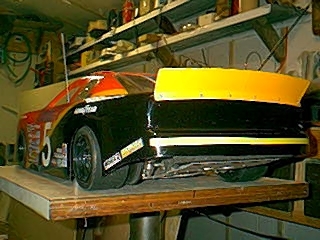 The cars are 48" long over 20" wide and 30 lbs. This is one of the cars New. 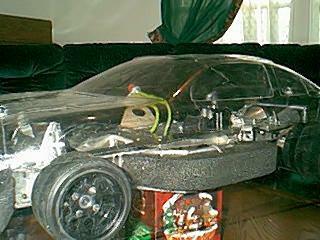 You paint the body add a 2 ch radio (I use a PCM) with (3) 1/4 scale servos (1 on the throttle and brake and 2 for the steering) and then fill the tank with c-16 racing fuel and your ready to go racing! Driver Josh Hawthorne Many years ago Josh sat on my knee and learned to drive. This clip is priceless to me. Here are a few pictures of Team car #5 sponsored by "DAD". Driver Troy Hawthorne Making the pass. 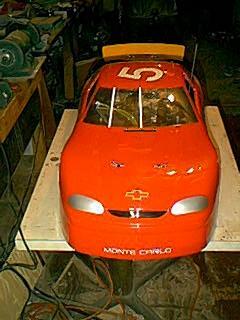 Here are a few pictures of Team car #6. 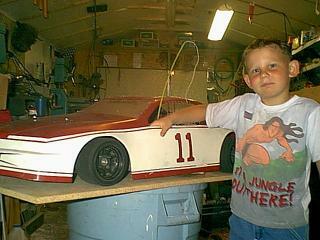 Car #11 sponsored by "DAD" and driven by my youngest son Justin. Justin learning to drive. Car #0 sponsored by myself and driven by my good friend Walt. We are getting ready to do some Truck Racing. More info can be found here. More of the Race Team Coming Soon!. RC Portable Track. Were we can take the fun anywhere. 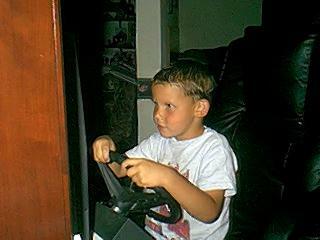 When the weather is not good outside Justin and Josh Race Nacsar 3 online. Here are a few tools we use to setup the race cars. Click for more details. 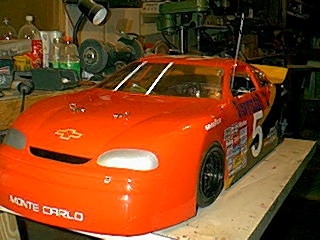 Click here to link you to my Quarter scale custom parts page. You can see how some of the back-up parts for the 1/4 scale cars are made. 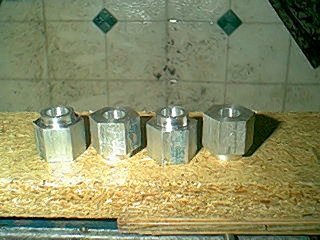 Sparkplug spacer used with the NGK brand long reach sparkplugs. Brake hub almost complete. 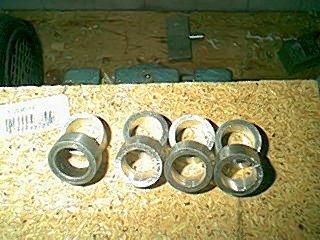 I have reworked this part to use a tension pin inplace of the set screw. I have also added a pin to lock the brake hub to the gear. Click here to Link you to Danny's Quarter scale website! 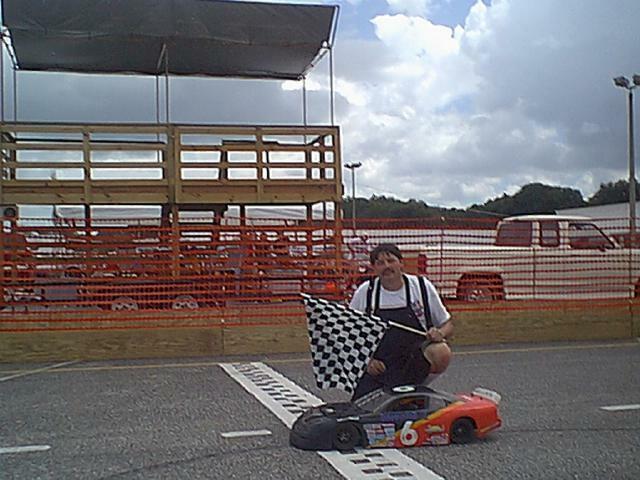 Alabama Quarter Scale Auto Racers: 1999 NCS Race #1 Hosting track in Montgomery, Al. How fast can the go? : Click here for that and more! 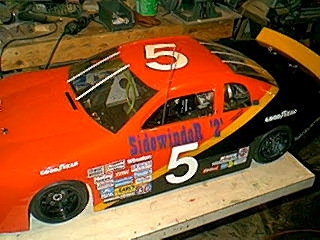 Click here to view some quarter scale cars in action!